Dawn Wright is the Chief Scientist of the Environmental Systems Research Institute (Esri) and is a professor of Geography and Oceanography at OSU. She also maps oceans, undersea volcanoes and hot springs. Dawn has worked as a seagoing marine technician for the international Ocean Drilling Program and is a post-doctoral research associate at the NOAA Pacific Marine Environmental Laboratory in Newport, Oregon. Q. What inspired you to pursue GIS? A. I was inspired to pursue GIS while a graduate student at UC Santa Barbara in the early 1990s when GIS was really starting to evolve from not just a mapping technology, but a whole field of science, now known as geographic information science or geospatial data science. So it was a FANTASTIC time to be introduced to GIS and to take courses from some of the great innovators of the field there at UCSB. Q. Who are your primary influential female role models, and how they have influenced your science career? A. My absolute top female role model is my own mother, an educator in speech communication, but always a beacon of integrity, grace, patience, and good humor. Others who have inspired me include Dr. Sylvia Earle because of her energetic, articulate, and crusading for the oceans and for the entire planet. Her ability to communicate with beauty and passion, as well scientific accuracy, has inspired me. I could go on and on but would also like to salute to Dr. Rachel Haymon, now retired from UCSB as a geology professor who taught me so much about how to lead scientific expeditions at sea and in the lab, and how to be unrelentingly rigorous and careful in doing science. Q. What do you consider as one of the scientific greatest challenges of our time that has the potential to be addressed using geographic information systems? A. Communicating science is one heck of a challenge right now, and is so very important in this age where science is being questioned, challenged, put in the category of fake news, etc., all with the stakes so high for our planet. GIS makes a terrific contribution to science communication through story maps. Q. Do you have any advice for young women today who would like to begin a career in geospatial sciences, or who are just starting out? Q. What does a “typical” day as Esri’s chief scientist look like? What are some of your day to day activities? A. Day to day I’m on email and GeoNet! 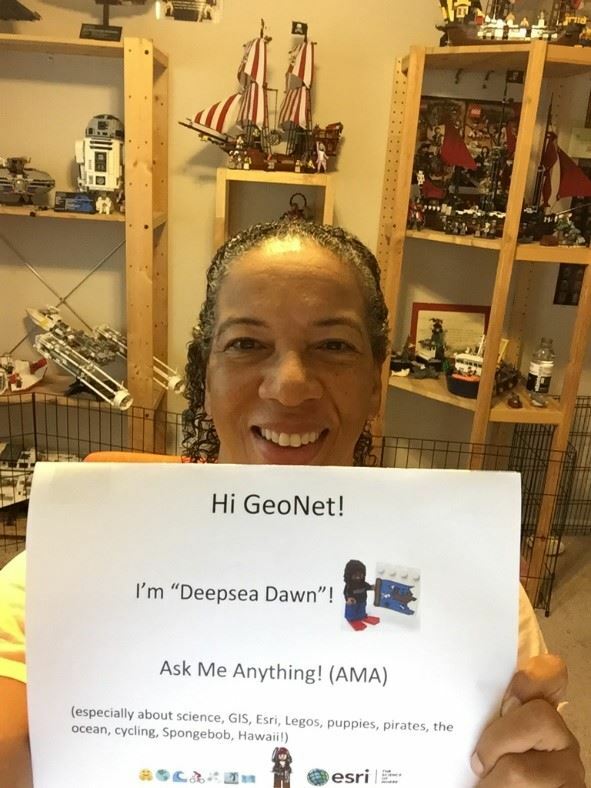 This content is reprinted with permission from Geonet AMA (Ask Me Anything) with Dawn Wright, Esri Chief Scientist session.